an excellent compilation of a number of scripts for managing your eComic collection in windows explorer. I've written a bunch of utility scripts in Perl for my own use, but I'd be willing to share them if there is enough interest. If you never use the command prompt, then this probably isn't for you. To use these scripts you will need to have a Perl interpreter installed. I use ActivePerl by ActiveState. Place the perl script in the directory you want to process. Attempts to fix file names that have had all the special characters changed to spaces or underscores. Standardizes spacing around parentheses, removes double file types and sets file type to lower case, adds parentheses around year, ctc, c2c, noads, fixed, of pages, of covers, scanner, adds parentheses around number of issues in limited series. [ex. (of 4)], removes file copy number at end of file name. [ex. filename (2)]. checks to see if .cbz files are actually .cbr files and vice versa. I found a surprising number of files with the incorrect type in my library. Any renamed files will be listed in the file "renamed.txt" that the script uses/creates. Attempts to match the comic name to existing directories and then moves them accordingly. This script checks the parent directory for matching names and sorts the comics accordingly, any comics that don't match are place in the misc directory. Duplicate files aren't moved and remain in the current directory. Looks in the current directory and makes a new subdirectory if there are 5 or more files with similar names. The threshold number for creating new directories can be changed by using notepad to edit the .pl file. makesort.pl scans the comic directory recursively and makes a list of the titles it finds and where it found them. listsort.pl can then be used to sort the comics in the directory in which it is run. You can choose a custom path for the file being moved by pressing 'c' and 'enter' and a new entry will be added to the "customlist.txt" file. testarchives.pl tests all the archives of the matching file types in the current directory and subdirectories.The results are saved in a text file named "corrupt.txt". 7-Zip must be installed for this script to work. setmodified.pl sets the modified date of an archive based on the date of the newest image file it contains. 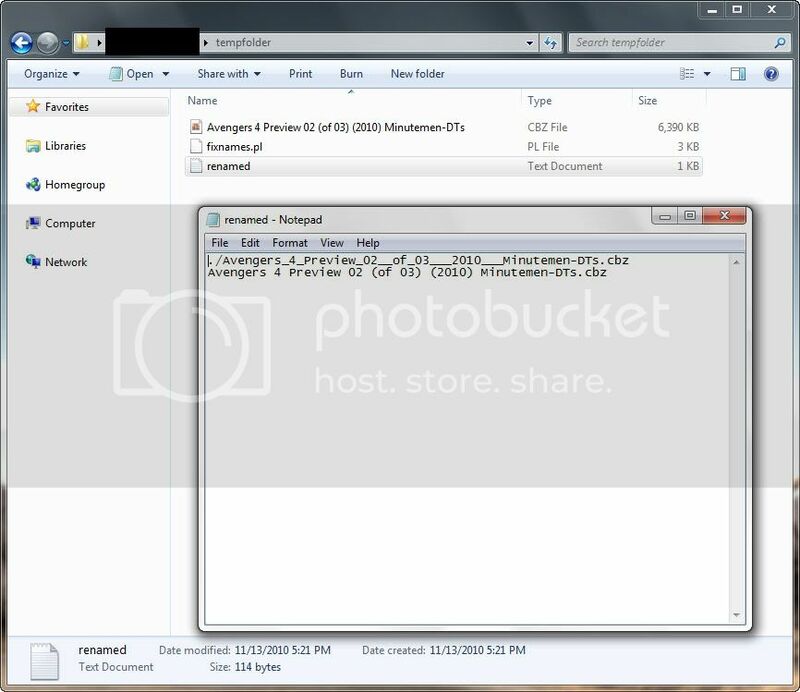 This script can also delete non-image files from archive, checks if cbr is cbz or vice versa, can attempt to restore the file name of an archive from the folder name stored in the archive, can test archives for errors, and checks if cbr or cbz contains other archives, renames them back to rar or zip if they do. addfoldername.pl adds the parent folder name to all the file names in the current directory. It prompts you to confirm that you want to prefix the file names with the folder's name. You can press 'c' and 'enter' to choose a custom prefix. extract&rename.bat extracts an archive into a folder named after the archive and prefixes each extracted file's name with the archive's name. It also strips numbered files of the original name while keeping the number. undorenamed.pl lets you easily undo any name changes made by setmodified.pl and/or fixnames.pl. This script reads the renamed.txt file and changes the file names back to the original names. addvariant.pl places image files in the current directory into comic archives with matching names. By default it will move any placed images to a folder named "done" if it exists. There is an option in the script to delete the original image file instead. finddups.pl scans for duplicate files in archives. The script can set the minimum number of matched files before listing, and can skip listing old matches. folder-namer.pl adds/updates year and mini-series suffix at end of folder name. You can turn off the mini-series style and the complete/ongoing tag for the mini-series style. finddupversions.pl looks for both the c2c and noads version of the same comic archive. You can set it to keep either the c2c or the noads version. The scripts look very promising.. In Fact, I've been looking for such scripts for a long time, but could never find a good one. I would, however, like to use the scripts.. would it be possible for you to provide an outline of steps required ? See my new comics & gadgets on: Tumblr! Last Edit: 8 years 5 months ago by 600WPMPO. Actually to just use these scripts it shouldn't be too complicated. 2. Place the perl script in the directory you want to process. I believe the ActivePerl Installation program asks to associate .pl files with the Perl Command Line Interpreter, if that wasn't done you just need to associate it with perl.exe found in the "bin" directory of wherever you installed Perl. Last Edit: 8 years 5 months ago by malor89. Yes.. it really wasn't that hard after you told the steps ! The only problem is that i want the brackets in the end around the scanners' name also..
Would that be possible ? In the meantime, enjoy a well-deserved +1 karma from me..! Some other scripts I could share are one the does simple file sorting, one that sets the modified date to the oldest file date in the archive, one that deletes non-image files (thumbs.db, links, etc.) from archives, a simple duplicate file finder. I don't want to waste time posting things people don't want, so speak up if something interests you. Please post these scripts also.. they look very promising and would be quite useful !! Actually your example was missing the ending underscore it should have been "Avengers_4_Preview_02__of_03___2010___Minutemen-DTs_.cbz"
If this is a recurring problem, it shouldn't be too hard to fix, the difficulty usually lies in making sure the fix doesn't break something else. Here is a simple sorting script that attempts to match the comic name to existing directories and then moves them accordingly. It's setup to work the way I do things, which is placing all new comics in a subdirectory of the the main comic directory. comicsort.pl checks the parent directory for matching names and sorts the comics accordingly, any comics that don't match are place in the misc directory. Duplicate files aren't moved and remain in the current directory. The first two lines of comicsort.pl can be edited if you want to arrange things differently. If the misc directory doesn't exist, the non matching comics won't be moved. Use notepad or another text editor to edit any of the .pl files. Yes.. I noted that.. and now it is working fine.. thanks! comicsort.plIt's setup to work the way I do things, which is placing all new comics in a subdirectory of the the main comic directory. comicsort.pl checks the parent directory for matching names and sorts the comics accordingly, any comics that don't match are place in the misc directory. Well..this is also an excellent script and does what it promises. More karma your way malor89 !! I feel that this is one steps too many. Would it be possible for the comicsort script to search the sub-directories (and, while I'm feeling lucky, for sub-sub-directories) of the parent folder ? Also, currently the script moves the files into pre-existing folders having matching names. This implies that we have to manually make a folder for each new series. Could it (or some other script) make folders based on the names of the cbz file ? Looks in the current directory and makes a new subdirectory if there are 5 or more files with similar names. Note: The script used to also sort the files into the new subdirectories, but I've found it works better to verify I like all the newly created directories first, and then run the comicsort.pl script after moving all the directories I want to keep to where they need to be. The threshold number for creating new directories can be changed by using notepad to edit the .pl file. To re-enable sorting, just remove the "#" from #rename in the .pl file. Could it (or some other script) make folders based on the names of the cbz file ? How cool is that !! Man, you are good at this.. ! 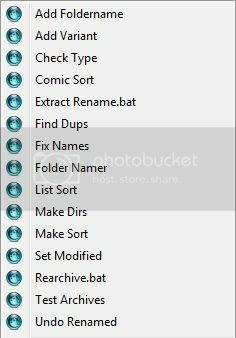 Would it be possible for the comicsort script to search the sub-directories (and, while I'm feeling lucky, for sub-sub-directories) of the parent folder ? However, this query remains still unanswered.. Facing some problems with the comicsort script.. When comicsort.pl checks the parent directory for matching names, it seems to require the exact name. So, would it be possible to modify the script so that it matches the file name with the initial alphabets of the folder ? It is notable that the script does not read the entire file name, but picks up just the series name from it. Similarly, it should also look for the series name in the folder name. fair, isn't it ?